Our CrystaLux LED Headlight & Fog Light Bulbs use the latest technologies available in an automotive LED bulb. Our bulbs will be a huge upgrade over your stock headlight bulbs. Available for the stock reflector housings, the Anzo Projector aftermarket housings and the Spyder Projector aftermarket housings. Available in either our CrystaLux G9 Series or G11 series. Read on and we'll help you determine which product you need. ·The G9 Series Bulbs utilize the LUXEON Z ES Chip which is a cooler running LED Diode (when compared to the CREE XHP chip). While smaller and cooler these lights still perform very well and throw light slightly further then the XHP Series. These bulbs utilize flexible aluminum sheets to dissipate the heat. These flexible aluminum sheets are spread out within the F150 housing to allow for proper cooling (see below). The bulbs are offered in a 5700 Kelevin temperature which is great at battling eye fatique. Actual light output is around 1,690 lux (~20 feet from the source). ·Our G11 Series Bulbs are packed with the LatticeBright HGL3 LED diodes. Similar in nature to the G9 Series, these diodes run cooler than the XHP Series. They still offer a great amount of light on the road with a much easier installation. Cooling is achieved with double ball bearing fans making them easier to install over the G9 Series. The bulbs are offered in a 6000 Kelvin temperature which is slightly whiter than the G9 Series. Actual light output is around 1,740 lux (~20 feet from the source). NOTICE FOR LIFTED TRUCKS: If you have a lifted truck (6" lift) you may have better results with the G9 Series. Due to the design of the large fan housing on the G11 Series, you will have limited height adjustability with the G11 series and may not be able to adjust the headlights down far enough due to the design of the bulb and the 6" lift. You'll want to choose the headlight housing that your truck currently has. Each style headlight housing uses a different bulb size (we'll known the correct size based on your selection here). If you've never replaced your headlight housings on your truck than your truck has the Factory Reflectors. If you've upgraded the entire headlight assembly to the Anzo or Spyder Projectors, you'll want to choose those instead. Don't worry, we know which bulb you need based on your selection here. We need to know if you plan to upgrade the low beams or high beams. You can certainly do both (just change the dropdowns after adding the first configuration to your cart). ·The G9 series bulbs will require larger caps when installed in the factory reflector housings. You'll want to choose the YES option from the drop down to allow room for the cooling fins. When it comes to the Spyders, you'll want to grab the larger caps as well. The Anzo low beams don't have a cap large enough so the cap that comes with your Anzo low beams will work (you'll just find it a bit tight on space when bending the cooling fins). 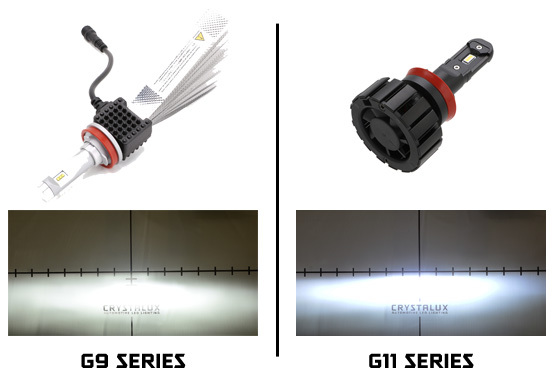 ·The G11 series bulbs will fit using the factory caps in a factory reflector housing, Anzos & Spyder housings. However we do recommend picking up a set of caps if you are replacing your low beams in the factory reflector housings. While the G11 series do fit without any clearance issues, the larger fan may rest against the side wall of the housing. This makes it difficult to re-install the factory caps as the factory cap will be sandwiched between the fan and the opening. This means you may have a difficult time aligning your headlight (the bulb won't move). For this reason we do recommend adding on the larger caps to ensure you have full adjust-ability with the G11 series. Spyder High Beam Note: Due to the design of the H1 bracket within the Spyder housings, we currently do not have an LED Conversion Kit that will work with the high beams on the Spyder housings. The G9 Series are offered in an H1 bulb size, however we've learned in our testing the bulb brackets don't fit over the bulb properly in the Spyders. The G11 series are currently not offered in an H1 bulb size.